Hi, I’m Bubble Gum Brain. I like to chew on my thoughts, flex, bend and stretch my brain, and expand the way I think! I make great mistakes that help me learn. I’m Brick Brain. With me, things are the way they are…and they’re probably not going to change much. I am the way I am…and that’s just how it is. 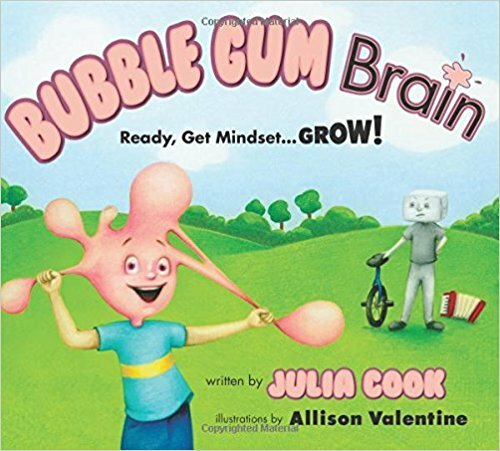 Meet Bubble Gum Brain and Brick Brain: two kids with two VERY different mindsets. Bubble Gum Brain likes to have fun adventures, learn new things, and doesn’t worry about making great mistakes. Brick Brain is convinced that things are just fine the way they are and there’s not much he can do to change them, so why try? When Bubble Gum Brain shows Brick Brain how to peel off his wrapper, Brick Brain begins to realize just how much more fun school…and life… can be! This creative story teaches children (and adults) the valuable lesson that “becoming is better than being,” which can open the door to a whole new world of possibilities!